To purchase an individual copy of this issue, follow the link below. Use the reference V37I6 and a PDF will be emailed to you. If you wish to purchase a print copy, please email coha@coha.org with your shipping details and the reference V37I6. On January 2, 2017, the swearing-in of Ricardo Rossello as the 12th governor of Puerto Rico reaffirmed that Puerto Rico’s statehood remains a contentious issue. However, Puerto Rico’s efforts are better suited to solve the country’s economic predicament. In Is Statehood the Saving Grace Puerto Rico Needs? 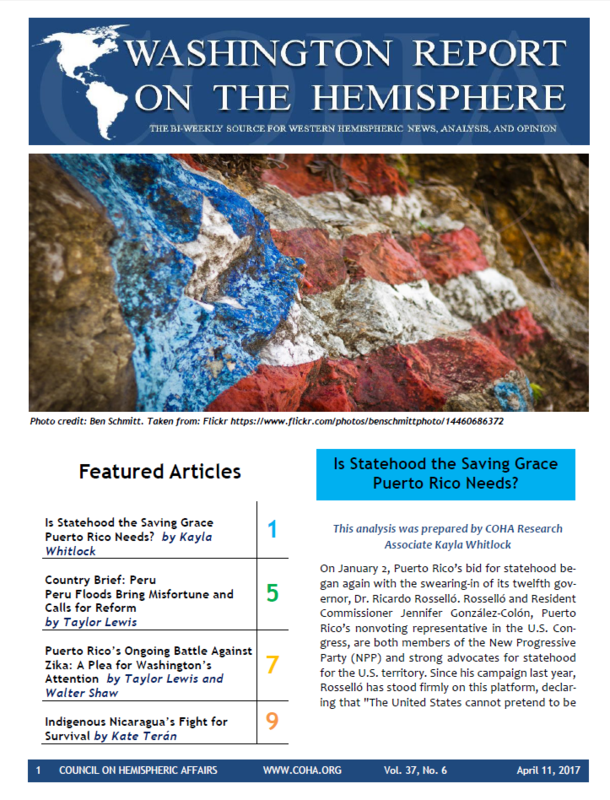 Research Associate Kayla Whitlock examines the nexus of challenges facing Puerto Rico, including statehood, Rossello’s referendum, and effects of economic contraction in the wake of an aggressive Trump administration. Over 37,000 cases of the zika virus have been reported in Puerto Rico since 2015 by the Center for Disease Control (CDC). In Puerto Rico’s Ongoing Battle Against Zika: A Plea for Washington’s Attention Research Associate Talyor Lewis, with assistance from Walter Shaw, looks at the asymptomatic disease that disproportionally effects Puerto Ricans. An examination of Puerto Rico’s hostile relationship with Washington, and dependent economic relationship, are factors that play into the ramped spread of the zika virus in Puerto Rico. In Indigenous Nicaragua’s Fight for Survival Research Associate Kate Teran discusses the topographical, cultural, and political divisions within Nicaragua. Specifically, the analysis of the Garifuna, Creole, Rama, and Miskito indigenous affiliation with the Misurasata guerilla group. Political tension between the Nicaraguan state and indigenous population has persisted ongoing conflict over ancestral land. The Nicaraguan government must make a conscious choice to devolve full power to the autonomous RAAS and RAAN regions. In Peru Floods Bring Misfortune and Calls for Reform Research Associate Taylor Lewis criticizes the Peruvian state for its failure to fund an adequate disaster relief fund to minimize the effect of increasing natural disasters in the region. On March 17, 2017, Peruvian President Pedro Pablo Kuczynski made a statement confronting the regions flooding. However, with over 115,000 homes destroyed, 100 bridges obliterate, and upwards of 70 lives lost; Peru is facing a predicament when it comes to urban and rural public safety.